In 1935, this Tribeca corner was occupied by a handsome three-story building. Today it is a parking lot and a decaying billboard. The buildings behind the lot are the same today as they were in 1935. Today, a "Dark Shadows" vinyl movie banner. 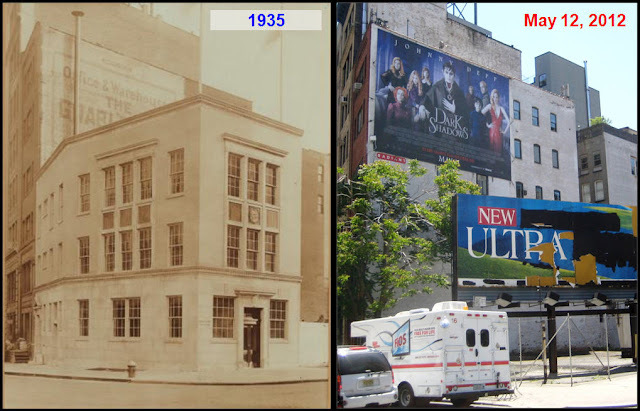 In 1935, an "Office & Warehouse" advertisement painted on the brick facade. But things are about to change, for the better or worse, depending on your perspective. Ground has been broken to make way for 9-story, glass-and-concrete, luxury condo with 16 units (See rendering below). Go see the parking lot and billboard before it's too late. The Ghostbusters Firehouse is just a few feet away (but we'll cover that in a dedicated blog post) CLICK TO ENLARGE. 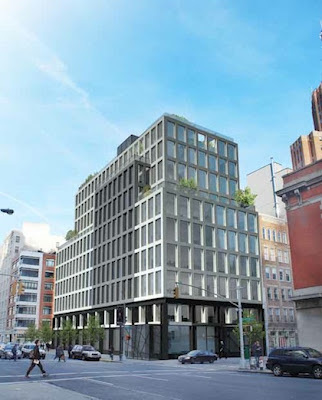 Rendering (looking North, opposite of images above), courtesy of Tribeca Citizen.